Tony Blair has denied reports he refused to speak at a world hunger conference because the organizers refused to pay him a £330,000 fee. The former prime minister’s office said there had been no negotiations over how much he would earn. Blair’s strong denial comes after an anonymous source told the Mail talks broke down over the speaking engagement because the event’s sponsors refused to pay the fee. A senior figure at Eat, the British food chain sponsoring the hunger conference, confirmed the deal had fallen through because the fee was too high. The controversial former Labour leader allegedly demanded £330,000 as a donation to his wife Cherie’s charity when approached by the Kruger Crowne talent agency. The conference paid former US President Bill Clinton £327,000 to speak last year, but intimated Blair was not worth a similar sum, according to the Mail. “Blair is just not Clinton, and even his star power is fast diminishing,” a source told the Mail. “So for his talent reps to think Eat was going to pay massive bucks for him shows they overestimated his worth. My impression of the asking price is it was way beyond what he was worth for Eat. Blair is also controversial. His background and history as prime minister is controversial because of the role he played in Iraq. “Some people don’t like his past, so when the forum organizers took that and the asking price into account, they decided to make do without him,” the source added. Eat’s executive producer, Odd Arvid Stromstad, confirmed the fee was too high for the company to pay. Tony Blair’s office strongly denied the allegations. A spokesperson said in a statement: “We have never had any contact with this talent agency and they were not acting on our behalf. “They approached the Cherie Blair Foundation for Women out of the blue, representing Eat, and all of their contacts were with the Foundation. “They asked if Mr Blair would give the keynote speech in exchange for a donation to the Foundation, but Mr Blair was unable to do so because prior commitments meant it would be logistically impossible. This is the reason why he can’t attend,” they added. Blair has come under scrutiny in recent years for his multimillion pound property portfolio and lucrative consultancy fees. Some of Blair’s controversial clients include the government of Kazakhstan, which stands accused of human rights abuses. The former prime minister resigned as Middle East peace envoy for the Quartet group last Wednesday after eight years in the post. 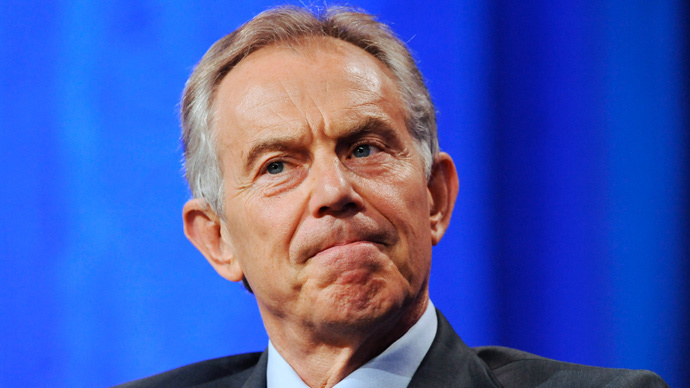 Twitter users derided Blair for his minimal achievements during his time in the job. “Congrats to Tony Blair on bringing lasting peace to the Middle East,” wrote Ishmael N. Daro, sarcastically.